Once the legalities had been established and it became known that the Crown was the legal owner of the salmon fishings around the coast there was immediate interest from individuals and companies that were looking for a slice of the action and willing to pay the Crown for that privilege. Let’s look at how this affected the Kincardineshire coast. Firstly boundaries had to be established in respect to the salmon fishing grounds so it would be known which salmon fishing station was responsible for which areas of the sea coast. Even this small detail, which seemed simple in principal, caused disputes between salmon fishing stations, particularly these neighbouring stations that were operated by different leasers. Cairnrobin was leased to James Dyce Nicol in 1859 for three years at an annual lease of £35, extended for a further five years in 1861 at the same rate, extended for a further seven years in 1866 at £72 per annum, extended for a further ten years in 1873 at £90 per annum. 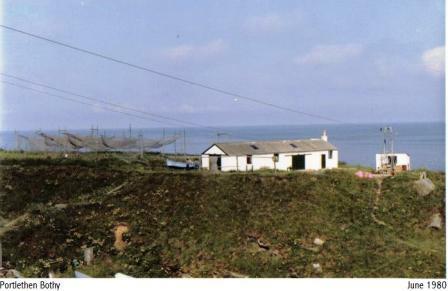 Thereafter this fishing station changed hands a number of times until being leased together with the station of Clashfarquhar in 1926. Findon was leased to Pirie and Munro in 1858 for three years at an annual lease of £125, extended for a further five years in 1861 at £190 per annum, extended for a further seven years from 1866 at £210 per annum, extended for a further ten years in 1873 at £220 per annum. 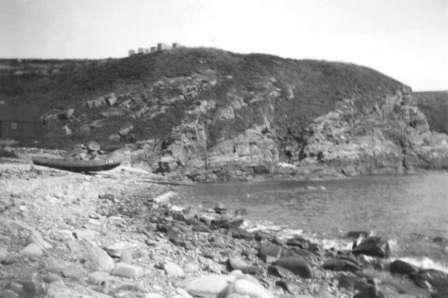 Thereafter this fishing station changed hands to James Gray in 1883 for a period of eleven years at an annual lease of £270 per annum. Portlethen was leased to J.A. Bertram (inheritors of the estate of Portlethen through Ernest Gammell’s wife, Rosa Ann) in 1866 for seven years at an annual lease of £160, changed hands to R.A. Taylor (again linked to Gammell’s wife, Rosa Ann) in 1873 and leased for ten years at £160 per annum, extended for a further eleven years in 1883 at £180 per annum. The Taylors continued to lease the salmon fishing rights into the 1900’s. Finally, Clashfarquhar was leased to John Yeats in 1866 for seven years at an annual lease of £40, this changed so that in 1873 the University of Aberdeen leased the rights for a period of ten years at an annual lease of £44 which was further extended by the University for another eleven years in 1883 at lease of £50 per annum. At the end of the 19th century and into the 20th century the rights changed hands to George and William Davidson and from then on to the Powrie Brothers. Over the years some of these salmon fishing stations closed down, a new salmon fishing station opened in Portlethen in 1953 and stations and salmon fishing grounds began to be consolidated. By 1962 Joseph Johnston & Sons, Montrose had the rights to fish the grounds of all the old salmon fishing stations and did so from one station – the one that had been built at Portlethen in 1953. 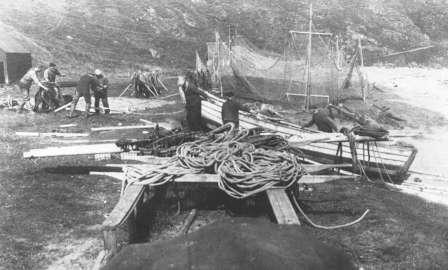 The salmon fishing industry on the Kincardineshire coast continued until 1980 when increasingly poor catches and higher costs forced Joseph Johnston’s to sell the rights of their lease. After tenure at Altens during the early and mid 1960’s my father, John, was the skipper of Johnston’s enterprise at Portlethen from the late 1960’s until its demise in 1980. My brother, Ron, spent a couple of his teenage years in the coastal salmon fishing industry working at both Newtonhill and Portlethen, and even I had one season working at Portlethen in 1976. From 1980 onwards Portlethen was no longer used as a salmon fishing station, although salmon fishing nets, operated by other leasers from other salmon fishing stations, appeared sporadically off the coast of Portlethen throughout the 1980’s and into the early 1990’s. As soon as the salmon station at Portlethen ceased operating in 1980, the bothy, station and associated grounds were put up for sale and were purchased by my father and brother. Ron has lived in Portlethen Bothy continuously since 1981.